Ebullient vitality and energy: J.N. Benjamin reviews Mufaro Makubika’s Nottingham-set play. Shebeen at the Theatre Royal Stratford East. Photo: Richard Hubert Smith. As the saying goes: you wait ages for a bus and three show up at once. Such has been the case this year for plays about the Black British experience. In April we were gifted the National Theatre’s production of Natasha Gordon’s debut offering, Nine Night; the following month Bush Theatre blessed us with a revival of Winsome Pinnock’s 1987 masterpiece, Leave Taking. Shebeen is third in line. It comes to London after a two-week week run in Nottingham, where it was born, is set, and and where it received its premiere. Matthew Xia’s production is full of the ebullient vitality and energy of Caribbean culture. The action takes place in August 1958 in St Ann’s where George (Karl Collins) has given up an illustrious boxing career to be with Pearl (Martina Laird). The two have recently migrated from Jamaica, and are setting down roots and planning a future in the UK. She longs to open a restaurant on the Wells Road, he is considering a return to the ring. Everybody is poor round there, even the white man, and to bring in a little extra income, the two of them turn their house into a illicit drinking spot – a shebeen. Pearl and George’s shebeen is a safe haven for many local immigrants and is full every night. Rachael Nanyonjo brings the party to life with her bright choreography and Grace Smart’s set literally explodes with excellence. Linford (Theo Solomon) and his white girlfriend Mary (Chloe Harris) visit every night to enjoy the vibes. But the good times don’t last for long. The colour-bar is raging hostility on the streets and mixed-race relationships are a contentious point in post-Windrush Britain. Hot summers bring hot tempers on the night before the Nottingham Race Riots. Mufaro Makubika’s 2018 Alfred Fagon Award Winning play captures the duality of the Black British experience. It acknowledges the contradiction that is that deep and inexplicable love for Queen Lizzie, while harbouring a level of contempt for a country that was inviting, but never accepting. Curried mutton and egg and chips are side by side in conversation. Laird as Pearl is the epitome of a migrant matriarch. She’s a mother, a lover, a friend, a breadwinner and a peacemaker. She cooks, she cleans, she’s a perfect host – she is all things to all people. The writing of this character is a ballad to the black woman, to their strength, their struggle and their sacrifice. And her performance poetic. She forgets not a single part of her body – a subtle flick of a muscle in her lips and her emotion is changed from anger to love; there’s a vulnerability in the wriggle of her nose, and anguish in the curl of her toes. She is mesmerising. The chemistry between her and Collins as George is gorgeous to watch. 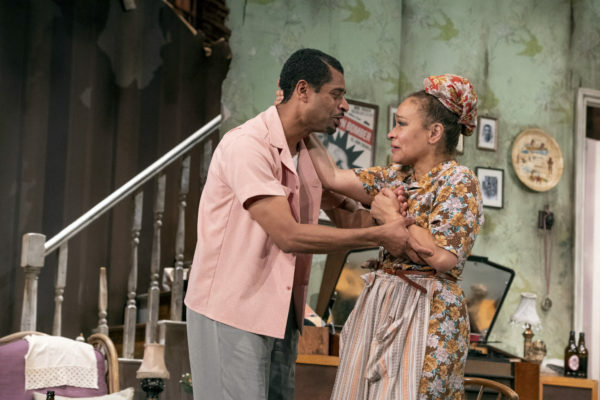 Whether bickering about honesty in the relationship or dancing to the sounds of Harry Belafonte, there is a warmth in their coupling that says they were made for these roles. Makubika’s writing presents gorgeous array of characters skillfully acted by a talented ensemble. Karl Haynes is endearingly awkward as Sergeant Williams, Theo Solomon’s Linford is a dignified and worthy boyfriend to forthright Mary, played with sass by Chloe Harris. Adam Rojko Vega doubles up as cheeky-London-chappie-sports-promoter Robert Dunne and thuggish bully Constable Reed. Hazel Ellerby is Mrs Clark; mother of Mary and local busybody; Rolan Bell’s Earnest is the comedian in the gang and Danielle Walters plays the firecracker Gayle, whose initial entrance takes your breath away. An unadulterated audience reaction is often more noteworthy than than the musings of those wheeled in to critique theatre. In my opinion, there were some parts of Shebeen that worked incredibly well, and other parts not so much. But, as I sat in the stalls, thinking about how I would write about what I had just seen, the audience all around me rose for a standing ovation. Feet stamped, hands clapped, and many hollered. It was the sound of a people who had waited too long for this bus to come; they had waited too long to be seen. They doubtlessly loved this play, and nothing else matters. Shebeen is on at the Theatre Royal Stratford East until 7 July 2018. Click here for more details.